The Delhi Police Special Cell has claimed to have shot dead two extortionists of Patna in an encounter last night when they came near Mathura Road of South Delhi to negotiate the purchase of an AK-47 weapon. The sleuths also claimed to have recovered two weapons from their possession. The National Human Rights Commission has issued notices to the Delhi Government, Police Commissioner and Delhi Development Authority, seeking report on the alleged human rights violations of slum dwellers being evicted from the Capital. 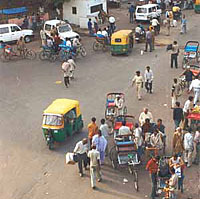 Recent attempts by the Delhi Police to decongest the section of the NCT between the Paharganj bridge and the New Delhi Railway Station are coming to nought because of old ways of policing that have led to certain malpractices by private bus operators who avoid the route altogether much to inconvenience of passengers. The Union Home Ministry has provided ‘Z Plus’ security to Mr Kishan Singh Sangwan, a BJP candidate contesting the Lok Sabha election from Sonepat in Haryana. Mr Sangwan apprehended danger to his life on account of his rivalry with the Haryana Chief Minister, Mr Om Parkash Chautala and the Director-General of Police (DGP) Haryana, Mr M S Malik. The district unit of the National Child Labour Society seems to be existing on paper only. The society which ought to prevent child labour and ensure the rehabilitation of minor labourers is yet to be registered. About 50 per cent of medicines on pharmacy shelves in the city are not the drugs for life threatening ailments, but drugs that themselves threaten life. New Delhi: After roping in Hindi film actress Poonam Dhillon and actor Suresh Oberoi for his election campaign, the BJP candidate in the Sadar parliamentary constituency, Mr Vijay Goel, has made Varun Gandhi agree to campaign for him. The District Election authorities have evoked the ‘Prevention of the Defacement of the Property Act’ during the election period. The political parties, candidates and their supporters have been warned against defacing the private and public property during the elections. The Haryana BJP has urged the Election Commission of India to declare entire Haryana a sensitive region and the parliamentary constituencies of Sonepat, Rohtak, Bhiwani and Kurukshetra as hypersensitive areas. One Jaigir of village Datoli never thought before marrying off his daughter that he would be terrorised by the money lenders to return the loan amount taken by his son-in-law, who is reportedly absconding along with his daughter. 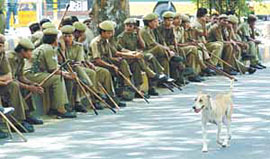 The spokesman of All India Jat Mahasabha and convenor of Haryana Jat Aarakshan Sangharsh Samiti, Mr Tara Chand Mor, today said that All India Jat Mahasabha would consider support to only those political parties in the forthcoming Lok Sabha elections, which included reservation of jobs for Jats in states and Central government services in their election manifestoes. 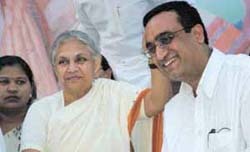 A day after Chief Minister Sheila Dikshit ruled out privatisation of Delhi Jal Board (DJB) and promised the removal of anomalies in the Unit Area Method (UAM) of assessing property tax, the BJP candidate in the South Delhi parliamentary constituency, Mr Vijay Kumar Malhotra, has reiterated the demand for reviewing the new tax regime. The North-East district police today claimed to have worked out 16 cases of motor vehicle theft and recovered two motorcycles with the arrest of four suspects from different areas of the Capital. Levis 501 has launched a new fit and 18 new finishes that resonate with the lifestyles of today’s youthful customers. The jeans, has attained an iconic cult status as the expression of freedom and individuality. Intricately woven through the fabric of five generations spanning a myriad of cultures and continents, the 501 jeans today remains as fresh and timeless as it was 130 years ago. 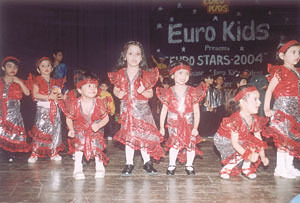 Children of Eurokids presenting a colourful cultural show at Siri Fort Auditorium. Schools are no longer reliant on publicity by word of mouth. Take the case of Pathways World School, a residential school offering International Baccalaureate (IB), which has decided to take to the roads. Once when Fritz Kreisler, the great violinist, finished a concert, a person came up to the stage and said, “I’d give my life to play the way you do.” Kreisler replied, “I did!” There is no magic wand for success. In the real world, success comes to the doers, not observers and the truth is that without hard work, there is no success. Nature, the great teacher and provider, gives birds their food but does not put it in their nest. Irate girl students and their parents burnt the effigy of Dr Shamim Sharma, Principal of the Hindu Girls College here yesterday, in protest against her dictatorial attitude. A local court has sentenced an Indian Army soldier to life sentence for killing his colleague over a trivial matter in Delhi Cantonment area eight years back. Noida is all set to finally make its only sports complex a part of the Commonwealth Games to be held in 2010 for which Rs.300 crore will be spent to enhance the facilities already existing in the sports complex located in Sector-21. Spread over 62 acres, the complex will have courts for badminton, squash, table-tennis, a gymnasium, hockey ground, football ground, cricket stadium etc. 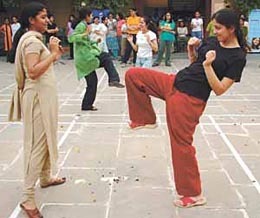 The resumption of the cricket series between India and Pakistan has generated tremendous goodwill among the people of the two countries, and the lucky ones from India, who were privileged to have watched either the One-Day International or Test matches, have only tales of unmatched hospitality and kindness to narrate. 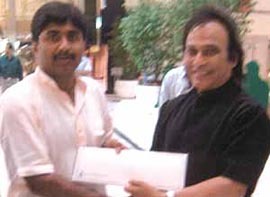 DDCA vice-president Suresh K Chopra meeting Javed Miandad in Lahore. 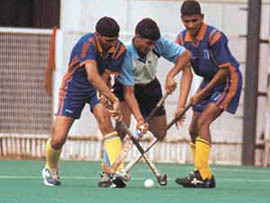 Khalsa Senior Secondary School, Ropar drubbed Guru Harkrishan Public School (GHPS), Loni Road 6-1 to sail into the semi-final of the second All-India Sahibzada Ajit Singh Gold Cup Hockey Tournament at the National Stadium on Sunday. Ropar knocked in three goals in the first half. The Parle Champions Trophy Cricket Tournament will be played among the six champion schools, who were winners of the Parle Cup Inter-School Tournament for boys under-17, held in Bangalore, Chennai, Hyderabad, Mumbai, Punjab and Delhi. Deadly bowling by leg-spinner Amit Mishra (5 for 25) and Prem Prateek (3 for 18) helped Lal Bahadur Shastri Club defeat Delhi Blues by nine wickets and entered the semi-final of the fifth ARBDM Cup Cricket Tournament at the Jawaharlal Nehru Stadium. Amit Mishra was named the man of the match. Ganga School defeated Guru Harkrishan Public School (GHPS), Shahdara 2-0 to enter the final of the inaugural D P Joshi Memorial Inter-School Under-19 Hockey Tournament at the Shivaji Stadium on Sunday. In the second semi-final, Union Academy defeated DAV, Rohini 8-0. A keen tussle for the ball during the semi-final match between Ganga School and Union Academy in the D P Joshi Memorial Hockey Tournament at the Shivaji Stadium on Sunday.